They're fluffy, light, and perfect topped with a pat of butter and some real Vermont maple syrup. We're talking pancakes, people! If you're looking for some seriously scrumptious pancakes, stop by one of these, our favorite places for pancakes in the state. At Zakes Café, you can taste dishes inspired by many different cultures. From India to Vietnam to Portugal, England, and Scotland—there's something for every craving at Zakes. The star of the show, though, are the pancakes. Butter pecan with caramelized banana or honey and lemon with fresh raspberries, anyone? Griddle 145 has wide range of good savory eats and tasty sweet treats, if you like your breakfast on the sweeter side. Their 'tella fella pancakes feature chocolate chip pancakes topped with Nutella, peanut butter, and sliced bananas. If that doesn't sound like a tasty sweet treat to you, we've got a real problem. Feeling something a little simpler? 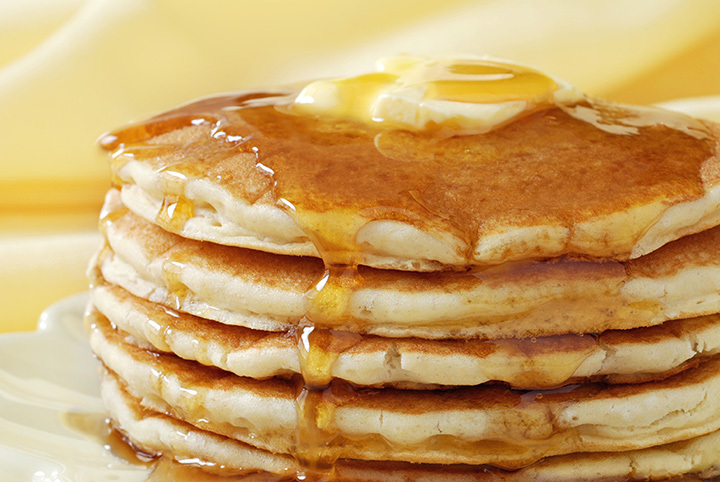 Classic buttermilk pancakes never disappoint. At Ida's Café, the specialty pancakes are where it's at. From classic chocolate chip to apple cinnamon, peach, and even sugar cookie—there's a pancake for everyone in your dining party at Ida's. You don't have to wait for weekend brunch to get your pancake fix at Bittersweet Kitchen. They offer their insane crème brûlée pancakes with vanilla pastry cream and burnt sugar all day, every day. What are you waiting for? In Pittsburgh, DeLuca's Diner is the place to be if you're craving pancakes. There are classic and fancy pancakes and then there are the heavenly hotcake sundaes you don't want to miss. It's a tough decision, but we'd have to go with the Funky Monkey or the Reese's Cup hotcake sundaes. These aren't your average pancakes. No, at On Orange, pancakes and waffles are of the Swedish variety. They're made using organic oats and served with maple syrup and stewed apples. No matter what you fancy for breakfast, there's something for everyone On Orange. At Pamela's, the hotcakes are made crepe-style. You can get them plain with a side of meat—or go all out with a specialty order. Specialty hotcakes are stuffed with fruit, a variety of fillings, and always topped with whipped cream. The chocolate chip banana hotcakes are the stuff of dreams. There's no shortage of options at Sabrina's Café. From simple buttermilk or whole wheat pancakes with a wide range of toppings to sides like veggie sausage, turkey bacon, and parmesan fries—Sabrina's is sure to satisfy. At Green Eggs, everything is done well. If you're looking for over-the-top sweet breakfast dishes, though? You won't want to be anywhere else. They have out-of-this-world red velvet pancakes and French toast that's stuffed with cookie dough. Do we really need to say more? Do you like your pancakes with a side of exclusivity? If you're one of the 31 members at Fred's Breakfast, you'll get just that. From 6-11 a.m., you can avail of reasonably priced pancakes and a whole host of other delicious breakfast dishes. And what's more? The coffee's always free! But you have to get it yourself.